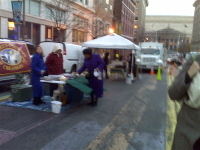 After work on Thursday, I headed over to the Penn Quarter Farmers Market to pick up some items for a Thanksgiving side dish I had in mind. To say that it was cold was an understatement (even in mittens, my hands were freezing), but my friend James and I braved to cold nonetheless. 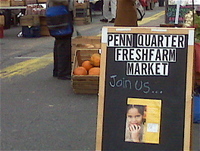 The Penn Quarter Farmers Market, part of the FreshFarm Market organization of farmers markets in the DC metro area, was established in 2003 and is a stone's throw from the National Mall. I have frequented the market several times before because of its close proximity to my office and its hours (3 pm to 7 pm), but usually only during the high growing season. At its busiest, the Penn Quarter Farmers Market has 18 food vendors, ranging from fruits and vegetables to meat and dairy. Visitors of this market tend to enjoy the convenience of its location to their offices and the hours (like myself), which means they can pick up something fresh from the farm for dinner that night. I use it as a market to supplement what I am scheduled to receive in my CSA box or to pick up a nice loaf of bread or a pastry from The Bread Ovens at Quail Creek Farm for that evening. This time, however, I had an express mission to find the remaining ingredients for my stuffing for a Thanksgiving potluck dinner. I don't usually put mushrooms in stuffing and had no intentions of doing so until I stopped by the Mushroom Stand. Run by Ferial Welsh, the stand sells mushrooms grown in Chester County, Pennsylvania that are certified organic. The Mushroom Stand only sells mushrooms from Phillips Mushroom Farms and Mother Earth Organic Mushroom Farms which are not mass produced mushrooms from huge agribusiness conglomerations and their quality speaks for themselves. Even though it was biting cold, Ferial was kind enough to offer me suggestions for mushrooms that would compliment a savory stuffing. She handed me a sample of a maitake mushroom, telling me it had a mellow, woodsy flavor that would work well in a stuffing. I had never even heard of a maitake mushroom, let alone tasted one, so I was a bit skeptical. However, she was dead on in her recommendation. Not only did it have a refined, earthy taste to it, it wasn't overly chewy like some mushrooms can be - even when cooked. I tweaked the recipe I had in mind a little in my head and continued on in search of bread. 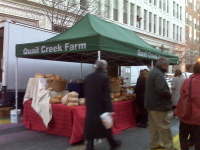 The busiest stand by far at the Penn Quarter Farmers Market is the Bread Ovens at Quail Creek Farm. Located on the Potomac River in West Virginia, The Bread Ovens at Quail Creek Farm use no preservatives or unnecessary additives in their breads, pastries, cookies and scones. If you are anything like me, this is a big selling point, as I am a label reader. If I can't pronounce it, it doesn't go in my body. I have spoken with various workers at the stand on several occasions about their baking process and their ingredients and have always received the same information. Their flours come from local millers and their yeast is fresh from breweries in their area (if only I could get in on some of those ingredients). When I asked which bread would work well as a stuffing, one of the guys pointed to a huge boule (and by huge, I mean it could also double as an ottoman) that I was almost convinced served as an anchor for the entire bread stand. This would definitely be more than enough bread to create a stuffing for a Thanksgiving meal (or a small army…which sometimes actually describes my family Thanksgiving dinners). Just as I was getting my change back, the crowd began to swell, so I high tailed it out with my ottoman sized bread. My final stop was Cibola Farms, a vendor I know quite well from my visits to Dupont Circle Farmers Market. Cibola Farms is a meat purveyor that sells bison, poultry, pork products and goats (yes, I said goats). On my first visit to Cibola at Dupont Circle, I spoke with one of the workers for about 20 minutes about their farm processes and slaughter methods. Their animals are not caged but are instead allowed to roam and graze on actual grass. Rather than using chemicals or overworking the land with heavy machinery, Cibola Farms uses their hogs and goats to maintain the grass for grazing. After that very informative discussion (I will spare you the details of their slaughter methods, but trust me when I say they are humane), I have been a regular customer. I have tried everything from their bison (a slightly sweeter meat than beef but with its own strong flavors) to their pork sausages. And it was their sage pork sausage that I had in mind for the stuffing. I picked up a package and called it a day. 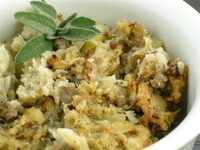 On Saturday morning, I gathered the onions, apples, fresh sage and celeriac from my CSA box, along with the bread, sausage and mushrooms from the market and decided to make a small test batch of the stuffing. My family takes their stuffing very seriously (an entire Thanksgiving meal was ruined once because a family friend had the audacity to show up with dressing, not stuffing…big mistake), something that has been ingrained in me. Although I won't be able to make it to Georgia for a family Thanksgiving, I will not show up to a potluck dinner with mediocre stuffing. And since this was a recipe I was making on the fly, I had to be sure all the ingredients worked well together. I was amazed at how well the celeriac, the root of celery, worked along with the mushrooms and apples, giving a sweetly subtle depth to the heartier flavors in the stuffing. A perfect addition to any Thanksgiving dinner. Grease a large casserole dish and set it aside. Spread the bread pieces out on cookie sheets and bake them in the oven 5-10 minutes or until slightly golden. In a large skillet, brown the sausage and then place it in a very large bowl (the bowl must be big enough to combine all of the ingredients). Add the onions, celeriac, mushrooms and apples to the same skillet, season with the salt and pepper and cook until softened. Add the onion mixture to the sausage and then slowly start adding the bread cubes. Thoroughly incorporate the bread cubes into the other ingredients before adding another handful. Once all of the bread has been added, toss in the sage and give the mixture another good stir. Pour in a portion of the stock and then stir it into the bread mixture. Continue this process until the bread mixture is moist but not a soggy mess. Pour the stuffing into the casserole dish, cover it with aluminum foil and bake it for 30 minutes. Remove the foil from the stuffing and continue baking it for another 10-15 minutes or until it is golden brown (but not burnt).